Call it unfortunate timing, but the first edition of the wonderful "AA Illustrated Guide to Britain's Coasts" was published in 1984, and has a section on the Kylesku Ferry which, it notes, "has long saved motorists a 100 mile detour" via Lairg. To be fair, in the time honoured tradition of producers of written guide books trying to provide a bit of future-proofing, the book does make reference to the new bridge then due to replace the ferry. A passenger ferry (a rowing boat) was introduced here in the early 1800s. Commercial traffic mainly comprised cattle on their way to central Scotland, and they had to swim across. Over the years various ferries came and went, and small car-carrying ferries first appeared between the wars. It was only in 1976 that the Maid of Glencoul, built in Ardrossan, became the first vessel capable of carrying fully loaded commercial vehicles. 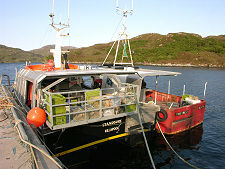 The Kylesku Ferry was unusual in being, for much of its life, free. The bridge you see today was duly opened, in 1984, by the Queen. 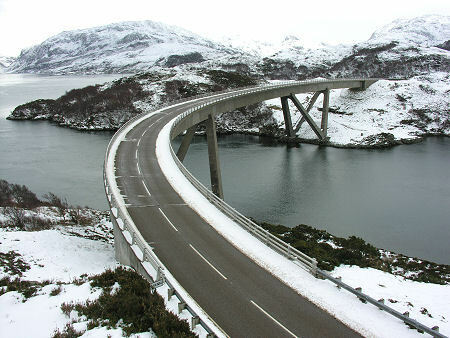 It must be one of the most beautiful examples of the bridge-builder's art anywhere in the world. 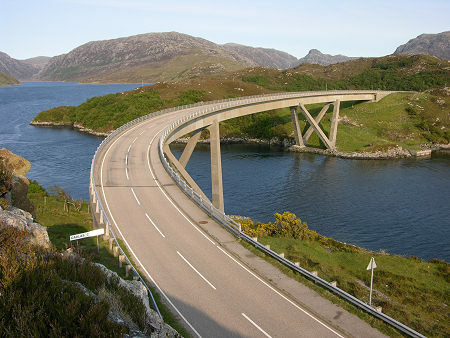 It may only be 276m long, and may only cross a 130m width of water, but it is transformed into something very special by its wonderfully curved design, coupled with the stunning scenery of Sutherland. And you have every chance to view the bridge, either from a car park on the northern side or from one at a lower level on the southern side. The latter gives an interesting insight into the way the bridge was constructed, plus views of its underside. The northern car park gives a better feel for the way the bridge fits into the wider scenery. On the north side of the bridge is the plaque celebrating the opening. 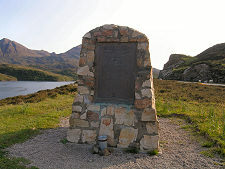 Also here, overlooking Quinag and Loch a' Chairn Bhain, is a cairn erected in 1993 to commemorate the 50th anniversary of the formation of the XIIth Submarine Flotilla, a unit of "X-craft" and "Chariot" miniature submarines which trained in "these wild and beautiful waters" from 1943. 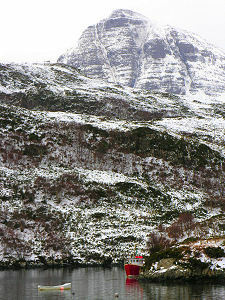 Kylesku itself stretches back along the road from the slipway that used to be the southern end of the ferry crossing. It is now by-passed by the main road heading for the bridge, but is well worth the detour of only a few hundred yards. At the end of the village overlooking the old ferry slipway you find the Kylesku Hotel. When the wind is still, Kylesku must be one of the most silent places you are ever likely to encounter, and whatever the weather it is an ideal place to catch breath and slow down, even if only briefly. Kylesku is also home to a jetty for locally-based fishing boats, and forlorn and grounded on the opposite side of the bay lie the remains of the Maid of Kylesku. 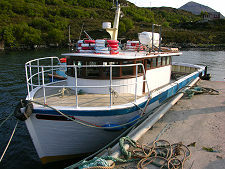 This two car ferry was built for the Kylesku crossing in the early 1950s, where it served until replaced by the Queen of Kylesku in 1967. This in turn was replaced by the Maid of Glencoul, shown at Kylesku on this page. Near the far end of Loch Glencoul is the 650ft high Eas-Coul-Aulin waterfall, Britain's highest, and four times the height of the Niagara Falls. Many visitors will fondly remember boat trips from Kylesku to see the waterfall aboard "The Statesman". "The Statesman" no longer operates, but another vessel, the "Rachael Clare" has picked up the mantle and offers trips from the slipway in the village during the summer.